Jack Crisp is using the pre-season campaign to settle into what he hopes will be a permanent role in defence in 2018. With one remaining in the 2015 season, four players stand to have featured in all 22 of Collingwood’s senior games this season. Collingwood recruit Jack Crisp has avoided a suspension but has been fined for betting on an AFL market while he was at the Brisbane Lions. A tall midfielder who wins the hard ball and has the ability to spread and use it well in space, Crisp’s versatility has helped make him one of Collingwood's most important players since arriving from Brisbane at the end of 2014. The 190cm left-footer has good hands and is noted for his ability around the stoppages, while his run, long kicking and strong tackling are other notable features of his game. He has notched three consecutive top ten finishes in the Copeland Trophy and is contracted until the end of the 2019 season. The remarkable reliability of Jack Crisp has continued into his third season in Black and White. Since arriving at the Holden Centre at the beginning of 2015, the hard-runner from Myrtleford hasn’t missed a single home and away game. He’s now the only man on the Magpies’ list to have maintained such consistency – captain Scott Pendlebury lost his streak when injury struck in late 2017. Crisp was integral to Collingwood’s game-style throughout the season. His role switched from a position in the midfield and on the wing, to a rebounding defender, often loose at half back. He produced back-to-back games of 27 and 25 disposals in rounds five and six, and tipped over the 30-possession mark against West Coast in round 18. 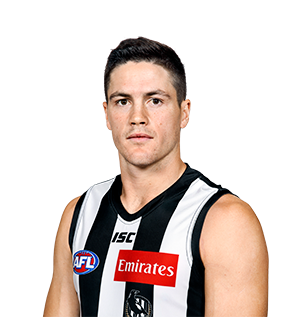 As the regularity of Crisp’s selection wasn’t an indication enough of his status as coaches’ favourite, he caught the eye of Nathan Buckley and his staff throughout the season. The utility earned AFLPA Coaches votes on three occasions, polling in rounds 11, 18 and 20. 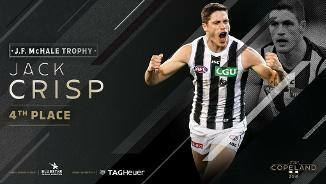 With many fans inside the Holden Centre, and throughout the Magpie Army, Crisp appears set to continue to go from strength to strength in 2018 and beyond. 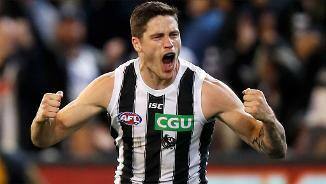 Backed up his breakout 2015 with another consistent season, but one that perhaps did not quite hit the same heights as his first as a Magpie. He played in all 22 games for the second time in as many years and won 20 or more disposals on 13 occasions, and importantly finishing the season in strong form. He ranked third for tackles and fourth for disposals, and earned ninth placing in the Copeland. Signed a three year contract extension during the pre-season that ties him to the club until the end of 2019. It didn’t take long in 2015 for Jack Crisp to limit the pain of losing midfielder Dayne Beams to a bare minimum. After landing at Collingwood as the part of the Beams deal with Brisbane, 21-year-old Crisp was largely an unknown commodity. Crisp was forced to wait until round 18 before he was able to force his way into the Brisbane seniors. But once he was selected, he made up for lost time, winning 20 or more disposals in four of his six games and kicking one goal and three behinds during the Lions’ big win over the Magpies in round 21. Crisp laid seven tackles against Gold Coast in round 18 and showed his penchant for breaking the lines when he took three bounces against Melbourne in round 19. When playing for Brisbane’s reserves, he won 20 or more disposals on eight occasions and registered 40 inside 50s for the season. A tall midfielder (190cm) who wins the hard ball and has the ability to spread and use it well in space. Crisp played two senior games last season and was best afield in the Lions’ NEAFL premiership win over Apsley. Was tipped to play more senior football in 2014. Came to the club as a rookie and was quickly elevated to the seniors, playing 10 games. At 190cm, he is a tall midfielder who showed a thirst for winning the hard ball. Is considered to be one of the best aerobic athletes on Brisbane’s list. Like Brisbane teammate, Tom Rockliff is a Murray Bushrangers midfielder who was snapped up by the Lions after being overlooked in the National Draft. He is a 189cm midfielder/utility who takes a good mark.